"My whole thing is to entertain, make people laugh and to forget about the real world for awhile." — Jon, commenting on the possibly weird pronunciation of his name. Daniel Edward "Dan" Aykroyd (born July 1, 1952) is a well known and celebrated Canadian/American comedian, actor, musician, ufologist and entrepreneur. He is also a Reserve Commander in the Louisiana Police, and carries his badge with him at all times — even stepping in to pull over a speeding driver, once. Both parents were in the civil service, and his family steeped in Spiritism — something that both generations of Aykroyds to regard highly. This would be the basis for Ghostbusters (1984), although Dan's father Peter still protests about the inclusion of the Stay Puft Marshmallow Man. Aykroyd senior has published a book about the Spiritism tradition that runs in their family, to which Dan contributed the foreword. In his youth, Dan was sent to a Catholic "seminary" high school, ostensibly to become a priest — but was later kicked out for a prank involving dressing a pig up as the Pope. It was at his next high school that he found his love of acting and the stage. This remained with him, as Dan went on to perform comedy at various clubs, while studying criminology at Carleton University. Aykroyd eventually joined the renowned Second City comedy troupe in Toronto. During this time, he was also running an after hours speak-easy, where he and John Belushi hung out when the latter came to Toronto. Belushi complimented Aykroyd's taste in music, and Aykroyd, surprised by Belushi's lack of knowledge of the blues (considering John was from Chicago, where blues became well known), offered to teach Belushi about the blues. That night, the Blues Brothers were born. In 1975, John and Dan went to New York City, where they joined NBC's Saturday Night (the original name of Saturday Night Live), headed up by an old friend of Dan's, Lorne Michaels. Dan became well known for his impersonations of Jimmy Carter and Richard Nixon, his highly energetic advertisements — such as the Super Bass-O-Matic — and also hosted Weekend Update alongside Jane Curtin. Other characters created by Dan would also go on to gain a following, including Fred Garvin (Male Prostitute), Irwin Mainway (a maker of dangerous toys), Beldar of the Coneheads (this would later be made into a movie), and of course, his musical group/act with John Belushi and the SNL house band, The Blues Brothers, which Dan and John Landis later turned into a highly successful movie. Over the decades, Aykroyd has occasionally turned up in SNL, mostly in cameos (some of which were on episodes hosted by John Goodman). Aykroyd, despite his reluctance to do so, became the most recent member of the original cast to come back and host SNL on the last episode of the 2002‒03 season (season 28). In 2010, he participated in a reunion of the parodied Presidents of the United States , which also featured Chevy Chase. In 1982, John Belushi (Aykroyd's friend and comedy partner) died of a drug overdose, becoming the very first deceased SNL cast member. Four weeks later, when presenting the Academy Award for Best Visual Effects, Aykroyd commented that, "my partner would have loved to have been here to present this award, given that he was something of a visual effect himself." He has also been known to refer affectionately to Slimer from Ghostbusters as "the ghost of John Belushi", owing to the Onionhead's party-animal personality. 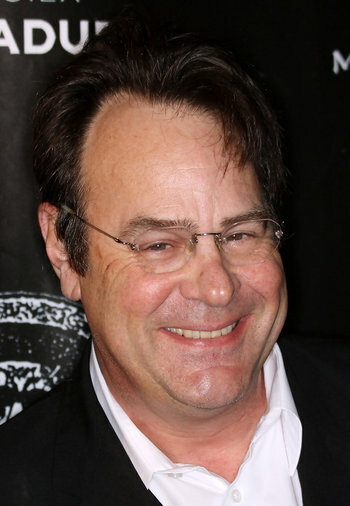 Following The Blues Brothers, Dan Aykroyd has had a successful career as an actor and writer, creating several more movies alongside friends from SNL and Second City, including 1941, Neighbours, Spies Like Us, Coneheads, and Ghostbusters (1984). He has also starred in other movies such as My Girl (and its sequel), Sneakers, Trading Places, Exit to Eden, Driving Miss Daisy and Grosse Pointe Blank. Further work has included ABC's sitcom, Soul Man, in which Dan played a widowed Episcopal priest, a role he also played in a Home Improvement episode, "Losing My Religion". Aykroyd also sung in the choir on 1985's "We Are the World" fundraiser single. In 1998, Aykroyd was awarded membership of the Order of Canada, a prestigious civilian honour given to those who make Canada, and the world, a better place. In addition to acting and writing, Aykroyd has turned entrepreneur, establishing a restaurant chain with Isaac Tigrett, House of Blues, which serves Louisiana cuisine, as well as being a music venue. Despite the chain now being owned by Live Nation, Dan is still involved with House of Blues, and performs at the venues as Elwood Blues, alongside James Belushi as Zee (Zurashayda) Blues. House of Blues also has a radio hour that is broadcast on a weekly basis by Dial Global, produced by Ben Manilla. Dan hosts the show as Elwood, sometimes simply providing linking material for themed shows, and sometimes interviewing blues, soul and R&B musicians. Despite being kept busy by his work with House of Blues, Crystal Head Vodka (based on his fascination with Crystal Skulls), and the wine label, Dan still somehow finds time to turn up in films and on television, including his appearance on the Family Guy episode, "Spies Reminiscent of Us". There's also the 2009 Ghostbusters video game, and his title role in the Warner Bros. Yogi Bear movie. He's been described by John Cleese as "The only Americannote He left out Terry Gilliam, and despite that Aykroyd is originally from Ontario, which is a Canadian province. worthy of being a Python."